← Live in West London and Don’t Have a Microchip? Scottish Rural Affairs Secretary Richard Lochhead has stated that a consultation will be published “within the next few months” regarding the use of electric shock and vibration collars. Options will include imposing tighter regulation and an outright ban. 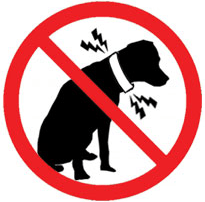 The Welsh Assembly Government banned the use of shock collars by passing the Animal Welfare (Electronic Collars) (Wales) Regulations 2010. They are also banned in Sweden, Denmark and Germany. New Zealand has issued guidance on their use and the State of Victoria, Australia imposes legal requirements on the technical specification and use which is permitted only under the supervision and written instructions of a veterinary practitioner or a qualified dog trainer. DEFRA funded research into the collars in 2011 and concluded that they “do not cause long-term or significant harm to dogs when used as per manufacturer’s instructions”. As far as DEFRA’s statement is concerned, the same could be said of all aversives including spike collars, citrus sprays and and choke chains. However, the fact is that owners abuse dogs every day, unwittingly and deliberately. There is an owner that I see regularly who thinks that the shock collar that is weighing down his Saluki’s neck is a good way of training recall. I presume that no non-Masochistic human would willingly return to a person who administered an electric shock to their body so I don’t see why a dog would either. The thinking behind administering an electric shock to “train” recall is that the dog realises that it is being punished for not coming when called and will only oblige when shocked. Nonsense of course. The dog is far more likely to associate being recalled with unexplained pain and fear. Some argue that it works as an aversive for livestock training; so did tying a dog to a ram for a day, but I doubt it did much for the welfare of either. There can never be any control over the way that owners use such devices and so in permitting use “according to manufacturer’s instructions”, the government is absolving itself of all responsibility. In any case, the manufacturer’s instructions are to administer an electric shock to the dog in some shape or form, with increasing frequency for maximum “efficacy”. This is neither an ethical not an effective method of training and the entire United Kingdom should ban their sale and use.